Clyde Hardware opened its doors at the hands of Charles and Margaret Walden in 1966. The Walden’s strived to create a simple store offering quality product and, above all, exceptional service. What set Clyde apart then, and continues to define the business today is the Walden family model: “to give real service, you must add something that cannot be bought or measured with money, which is sincerity and integrity.” The knowledge, gratitude, and passion of Charles and Margaret resonate today in their daughters, now owners, Sarah Hildebrandt and Martha Merwin. Sarah and Martha have guided Clyde through a marked evolution; what began as a small storefront in downtown Phoenix has grown to one of Arizona’s premier decorative plumbing and hardware showrooms. 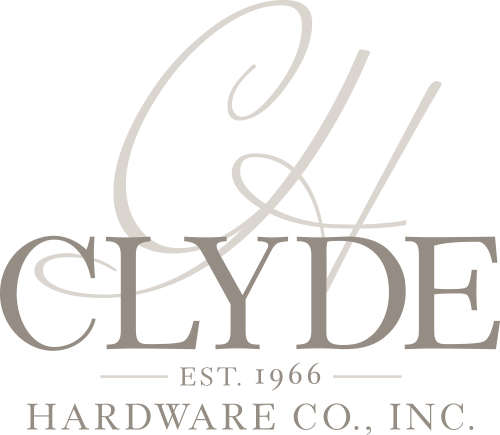 With nearly 5,000 square feet of product displays from the industry’s leading plumbing, cabinet, and door hardware suppliers Clyde is ideal for any project, be it a small scale remodel to a custom home build. Clyde also caters to the southern Arizona building market through a Tucson showroom and warehouse. Of course, the Walden ladies have not strayed from their roots and maintain the tool and functional hardware avenue with which the business began. The showroom sales staff is a collection of experts within the industry, prepared to assist contractors, designers, architects, and homeowners alike. Sarah and Martha look to the rapidly approaching fiftieth anniversary of Clyde Hardware with abounding pride and anticipation. The Walden ladies know the true joy of their business has been the journey rather than the destination. The entire Clyde family looks forward to a future blessed with success rivaling that earned in their history.